TechCrunch was one of the first interactive projects I took on. 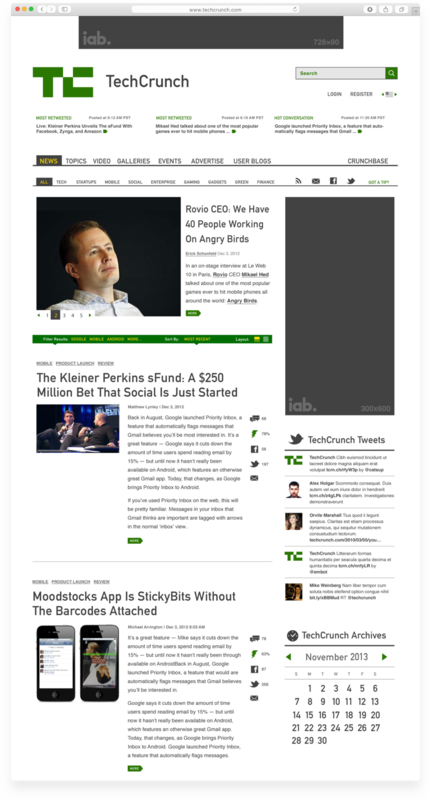 The idea at the core of the redesign was to strip away the gimmicks that didn't enhance the user's experience and focus on delivering content in the tone unique to TechCrunch. We wanted to create an elegant way for people to scan articles, read, comment, and share quickly. The logo is a visual nod to the blips of light on a screen — how we visually interface with tech. By reducing the C and T to a space of 18 pixels, the mark uses a bare minimum of space for maximum impact. Writ large, the becomes mark reflects TechCrunch's bold and sharp approach to journalism. The site has changed a lot in the passing years but the logo remains.